Peanut and peanut nutrition facts are most popular “nut”. It is very delicious in taste and related to the legume family along with beans and peas. Peanut is classified as nut due to its qualities of true nuts like- almonds. Other names are- groundnut, earthnut, monkey nut, pygmy nut, pignut or goober peas. It is produced from the ground, so it is called groundnut. Peanut is a rich source of nutrition and is a calorie dense nut which contains significant fat. It considered a cheaper substitute other than almonds, pistachios, cashew, pine-nuts, and walnuts. Due to rich nutrition, it is very useful in preventing diabetes, preventing depression, preventing stomach cancer, health in healthy pregnancy, helps in heart health, promote weight loss, and boost memory and more. Peanuts are enclosed with a hard wrinkled outer sell and contain two or more kernels. It contains egg-shaped seed inside the sell or pod. Seeds are used in making of peanut oil, peanut butter, protein powder, and flour. Vitamin B3 or niacin present in peanuts and this boost our brain system and boost memory. So, also peanuts work as “brain food”. Also, flavonoids (resveratrol) present in it and that aids in improving the flow of blood in our body. Folate present in peanut in rich quantity and folate is very beneficial during pregnancy. If peanuts consumed before or during pregnancy period, then it folate of peanuts reduces baby born risk with neural tube defects. Also, consumption of peanuts reduces the risk of allergies illness like- asthma. Regular eating of it, then it helps to reduce the risk of weight gain. Fiber, fat, and protein are present in peanuts and these contents make peanuts as very satiety food. So, it lowers your appetite. Energy content is high in peanuts and it improves metabolic rate. Therefore, it is very helpful to lower weight gain. Low serotonin value is responsible for causing depression. Tryptophan, which is an amino acid present in peanuts and tryptophan helps to increases the release of serotonin levels and thus aids in the fight against depression. For staying fit, healthy, and keep away from dangerous illness, you need to minimum consume two tablespoons of peanut butter on a weekly basis. Alzheimer prevention is one of the peanut health benefits due to peanut nutrition facts. 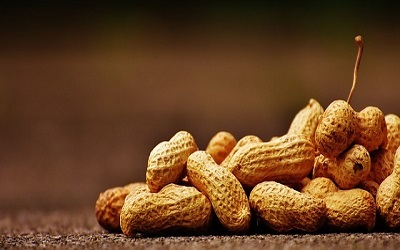 Niacin is present in peanuts in rich value. A study shows that the risk of generation of Alzheimer’s illness is reduced by niacin-rich foods. Mineral “Manganese” present in peanuts which plays an important role to help in the prevention of diabetes. This mineral “manganese” improves fat and carbohydrate metabolism, so, more glucose enters into the liver and in muscle cells. Thus, it aids in maintaining blood sugar levels. Peanuts play an important role in keeping health heart because it contains mono-unsaturated fatty acids in rich value. Also, peanuts contain oleic acid which aids in lower the low-density lipoprotein (LDL) or bad cholesterol levels and increases high-density lipoprotein (HDL) or good cholesterol levels. In peanut health benefits stomach cancer prevention have an important place due to peanut nutrition facts. A high value of poly-phenolic acid (anti-oxidants) present in peanuts. P-coumaric acid plays an important role in reducing the stomach cancer risk and this is done by carcinogenic nitrous-amines generation. Peanuts contain a good value of dietary protein which contains the fine quality of amino acids. Amino acids play an important role in improving proper growth and well development of the body. When bile acids contain too much bad cholesterol (LDL), then gallstones produce and these are semi-solid blobs. I already discussed that peanuts contain monounsaturated fatty acids in rich quantity, which reduce the LDL (bad) cholesterol levels and increase HDL cholesterol levels (good). Therefore, peanuts play an important role in preventing gallstones. Monounsaturated fats and resveratrol present in peanuts which helps in providing a glowing skin. Dietary fiber present in peanuts in high value which aids in flushing out the excess toxins. Therefore, peanuts provide skin clear and flawless. Vitamin E present in peanuts which helps to fight against oxidative damage stress for keeping healthy skin cells. So, vitamin E protects our body against UV rays. Peanuts contain anti-aging properties, due to vitamin E and vitamin C and these vitamins fight against aging signs like- spots, wrinkles, and fine lines. Biotin plays an important role in hair growth and overall scalp health. Biotin (B-vitamin) and folate present in peanuts and they are beneficial for healthy hair. Lack of biotin is responsible for hair loss. Omega-3 fatty acids present in rich value in peanuts which provides scalp strength and improve hair growth. The anti-nutrients substances of peanuts usually impair the nutrients absorption in the body. Therefore, this reduces the nutrition value of consumed food. Sometimes the contamination of peanuts can generate toxic substances. Therefore, you get loss of appetite and yellow discoloration of the eyes leading to jaundice and all the typical signs of liver problems. You can get a sharp and sudden pain on the right side of the abdomen due to gallbladder contraction. If you have gallstone problem then you need to stay away from peanuts. Therefore, there are many valuable peanut health benefits due to valuable peanut nutrition facts.